Make the item (if not already made). Ship item off to buyer. However, with almost 300,000 active sellers currently on Etsy (and a substantial number on the internet in general), it’s increasingly important to take a few moments and examine the third and final step. A few minutes is all it takes with each order to ensure the packaging is up to par or exceeding buyer standards. In this consumer driven online marketplace, ATTENTION TO DETAIL IS PARAMOUNT. The way you package your Etsy orders for shipping can be the single deciding factor in a customer coming back to you for not only another order, but several orders. With scores of competitors making similar items you can use your packaging to set you apart from the others. One of the most important things to do is develop a signature packaging style and stick to it for continuity. Use colors that are relevant to your Etsy shop — I use black and white–as coordinating colors will stick in the buyer’s mind. 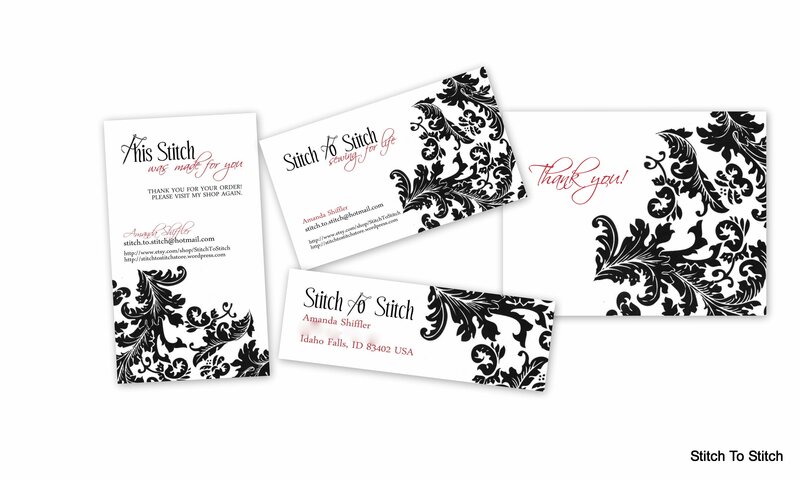 For fairly cheap you can also customize business cards, note/thank you cards, return address labels and stickers to match your theme. After you establish your packaging style, follow these important tips to ensure premium packaging. Make sure your items are in tip top condition. With clothing items make sure all loose threads are clipped, the fabric is neatly pressed and there is no lint or hair (pet or human) stuck to the fabric. Wrap items in materials that will not transfer color/ink to your items. Newspaper might seem like a fun way to “upcycle” but the ink will rub off on fabrics if the weather is humid or the package gets wet. Tie your packages with ribbon. Protect items from the weather. Use waterproof polymailers or put wrapped package inside a seal-able plastic bag. Use pristine packing materials whether new or previously used. Keep in mind your buyers if using upcycled/recycled packaging components. Some buyers prefer new packaging materials when purchasing new items; buyers buying upcycled materials might prefer upcycled packaging. Tuck a hand-written note, a business card and possibly a discount code in with the items. Include freebies if you desire, making sure they match the theme of your shop. Pens and magnets make great add-ons and work as fantastic marketing tools. Don’t include soap/heavily perfumed items if you sell edibles, fabric, clothing or anything else that could absorb the scent. Write out labels as neatly as possible or use your computer to print them. Put a copy of the address inside the package for international packages. Domestic packages would benefit from this as well, but I will admit that I don’t always include a packing slip. This is on my list of things to improve upon. 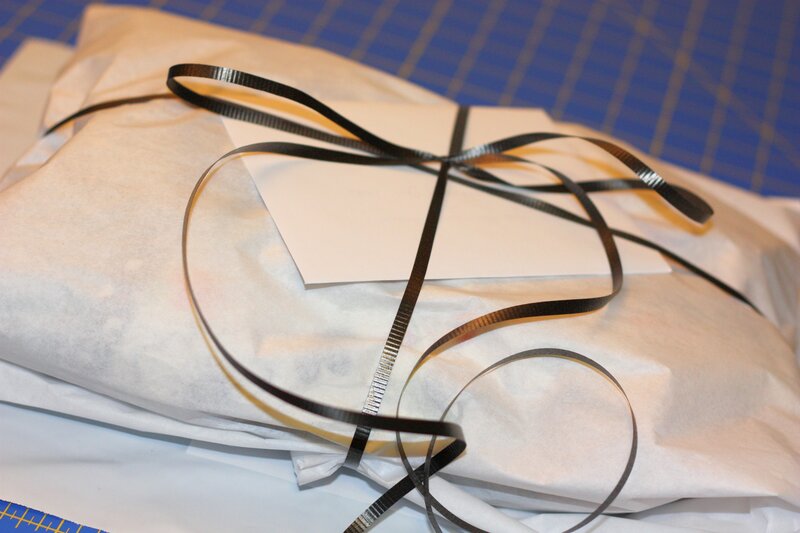 When taping packages closed or labels on the package make sure there is no hair stuck on the tape. Add a shop sticker to the outside of the package to catch the attention of anyone who handles it. This is what my packages look like before going in a polymailer. My hope is that the recipient will be excited to open it when it arrives on their doorstep! This entry was posted in etsy, small business by Stitch To Stitch. Bookmark the permalink. would you please tell me which company did you use for your business card, etc. ? I would love to see if they are better than what I am using!